Endries International, of Brillion, Wis., has more than 500 customers worldwide, stretching far beyond its birthplace in northeast Wisconsin to Europe, Mexico and Canada. Each customer may have hundreds, even thousands, of bins holding nuts, bolts, pneumatic and pipe fittings, wires, electrical components, clamps, and many other parts. 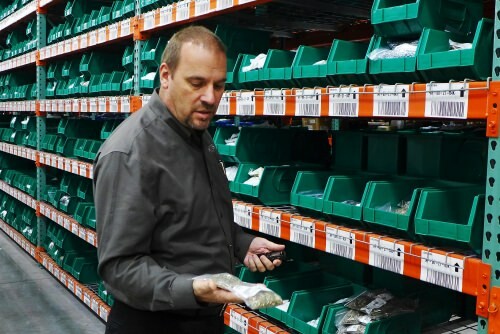 Endries manages more than a half million unique items, ensuring an optimum inventory level for each customer. Recently, Endries introduced Pulse, an automated, foolproof mechanism that instantly informs the company when a bin is empty. 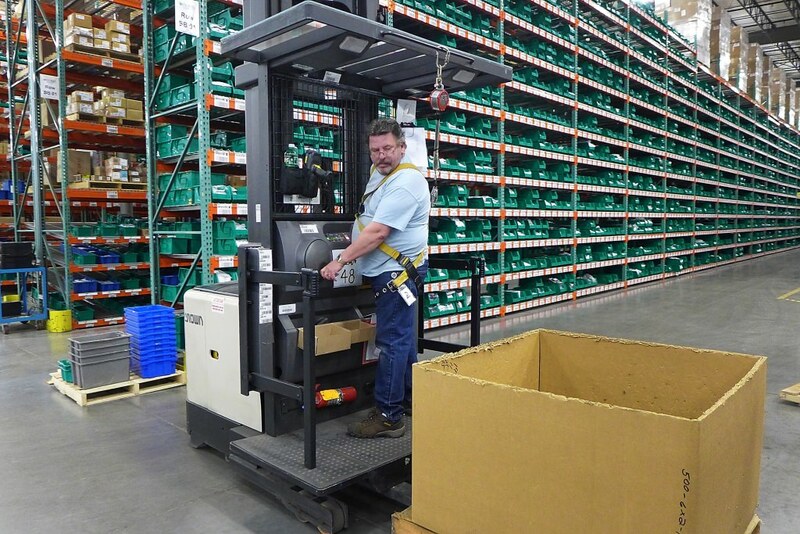 While Endries processes the order to replenish the empty bin, the customer obtains the same part from a second bin. Until recently, Endries only received the “empty” notice after its service representative checked every bin at a customer’s facility, which might happen only once or twice a week. Now, with a new, high-tech solution crafted in cooperation with UW–Madison engineers, workers on the manufacturing floor simply drop the empty bin into a chute for electronic identification. From there, the “time to restock” message reaches Endries within a minute, so those parts will be on the next truck to that manufacturer, not the truck after that. Endries had long wanted to speed up that notification, says Todd Fischer, the company’s vice president and corporate information officer. He says the critical link between “can we?” and “can do!” was forged in alliance with the UW E-Business Consortium, a collaborative group of businesses founded in 1998 at the UW–Madison College of Engineering. At regular meetings and special interest groups of the consortium, members discuss best practices, innovative strategies and emerging technologies. The enabling technology for PULSE, called RFID (radio frequency identification), works when a small antenna passes through a larger one. 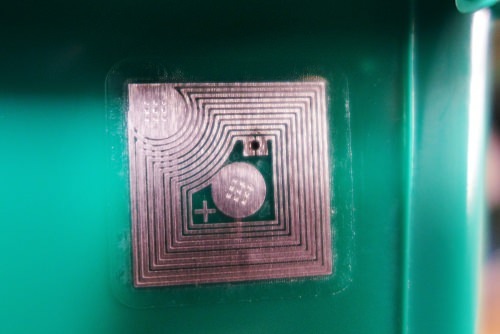 RFID is used in electronic toll payers and for many other purposes. Unlike bar coding, no line-of-sight connection is required between the tag and the sensor. In 2003, UWEBC built an RFID lab in response to growing interest within the consortium. “We started a journey to learn what it is, what it can do and what it can’t,” says Alfonso Gutierrez, executive director of the lab. When Endries first brought the notification question to the RFID lab, the technology was still too expensive. In the meantime, insights gained from UWEBC helped guide Endries in other ways, such as configuring the best software packages for customer relationship management, and for internal collaboration. Endries took part in UWEBC’s first research workgroup on e-procurement strategies and systems, and got “actionable ideas” on improving efficiency at its vast distribution center, says consortium founder-director Raj Veeramani, a professor of industrial and systems engineering. “Our relationship with Endries combines three key elements of the UWEBC: improving the competitive advantage, providing innovative strategies for emerging technologies, and achieving operational excellence,” says Veeramani. The consortium has about 65 members. Less than two years ago, Endries brought the empty-bin question to the RFID lab, and within a year, students and staff had assisted in the selection of a radio frequency, antenna and software to support instant, fool-proof bin identification. RFID tags cost only a dime or so each, but the real cost and complication came in crafting a system that would automatically send a signal from the PULSE device across a wireless network to the internet, and ultimately to the “data warehouse” at Endries headquarters — notifying that its customer has emptied a bin holding, for example, a hardened steel, 5/16 inch by 1.75 inch, fine-thread, hex-head bolt. Endries has been testing PULSE with a limited number of customers. It is now officially announcing the system, says Fischer. PULSE offers compounding benefits to Endries, which has grown from a business Bob Endries opened in Brillion in 1970 to stock auto repair shops into the fifth-largest fastener distributor in the nation.